Take a look to this exclusive review of the upcoming MMO of Splitscreen studio, Dino Storm. 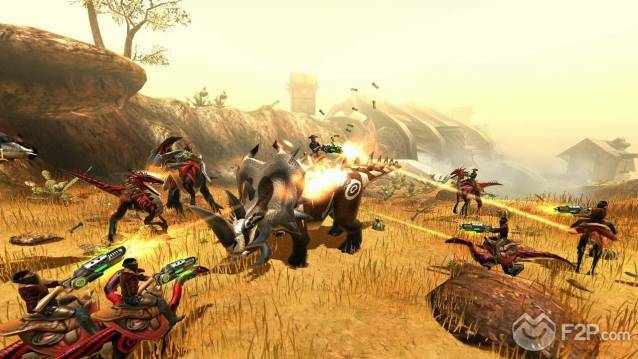 Dino Storm is a free to play 3D MMORPG browser game. 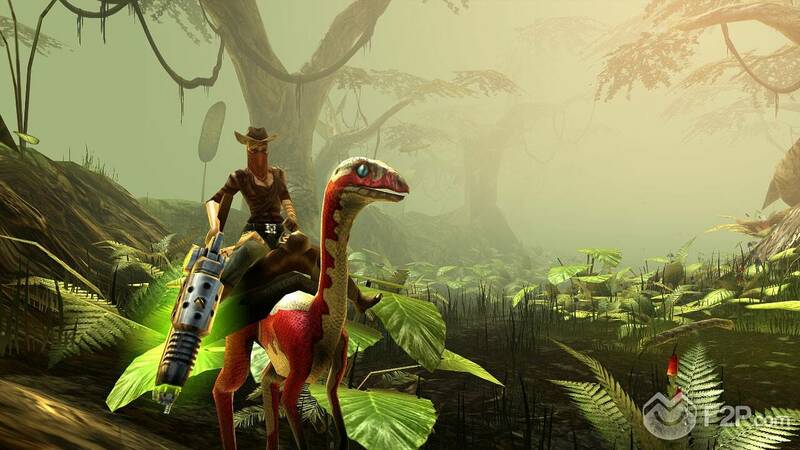 Dino Storm is a free online multiplayer game with rich 3D visuals. You are a brave ranger, who is leaving for Dino Ville, where rich veins of gold have been discovered. With just a few dollars in your pocket, a little ammunition, loaded laser cannon, and your small dinosaur, you make your way to the once quite western town. Face down gigantic herds of dinosaurs and merciless robber bands and start your thrilling search for valuable items. Set up supply camps, outposts, and goldmines, defend them against other players, and earn fame and respect. Only the best will manage to rise to become the sheriff of the town. As it is a browser based MMO, to enter the game you just have to login, download a small applet and you are in the Wild West. Dinoville Courier welcomes you in the game, providing the last in-game news. Then you enter in the game with a character and a dinosaur. The game looks nice and the Wild West landscapes are well rendered with quality graphics. The interface is simple; on the bottom in the middle there is a bar with your health and stamina, the weapons, the ammo, and boosting stuff, which you can activate when needed by clicking on them. On the left upper corner, you can see your character profile and by clicking on it you can access your inventory, your money, your characters and your dinosaurs profile, the game guide and the friends page. Here you can also see your level, the experience bar and your fame. In the bottom right corner, there is a mini-map of the area and of the world. Dinostorm features a game guide, which helps you to do your first steps in the game. There are nine chapters in the guide and each of them offers a bunch of quests that you need to complete to become more powerfull and famous in Dinoville. The last quest of the guide consists in becoming a sheriff of the city. The first thing you have to do is to reach Dinoville, the main city in the game. To get there, blue footprints on the ground help you to find your way. To move your dinosaur you can use the classic WASD or the arrows keys or the mouse. On your way you will find some rewards and you will learn that your Dino needs to drink from time to time. On the way you need to complete some missions. For instance, we needed to hunt some entelodons, a kind of prehistoric warthog, to get their meat and bring it to a NPC for rewards. Or we had to collect some worms for a NPC, or we had to kill some dinosaurs, and so on Then we traveled through Dinoville Canyon to Dinoville. We are now in Dinoville, there are tons of missions to complete here too. Missions grant you gold coins and experience each time you complete one. Prepare yourself to be spending your time running (slowly) on the map from NPC to quest and from quest back to NPC. 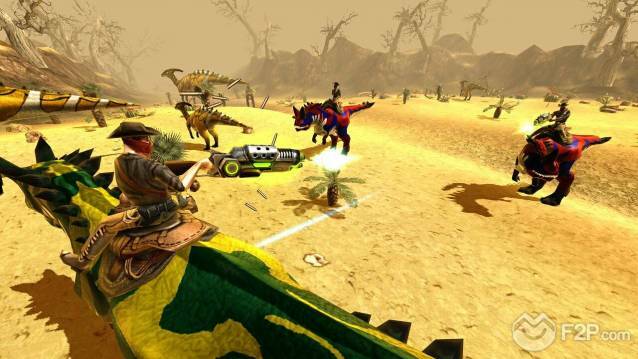 The combat in Dino Storm is easy (and maybe not that exciting); you choose a target with the mouse and your character automatically starts shooting at it until he kills it, you cannot aim by your own and push and relieve the trigger, which is a bit annoying and takes off some fun from the game. You can only choose the type of weapons and ammo, and some boosters that you want to activate when shooting. Maybe it would have been more interesting to let the player push and relieve the trigger as he likes. Also, the combat is a bit slow paced, maybe because of the beta version. 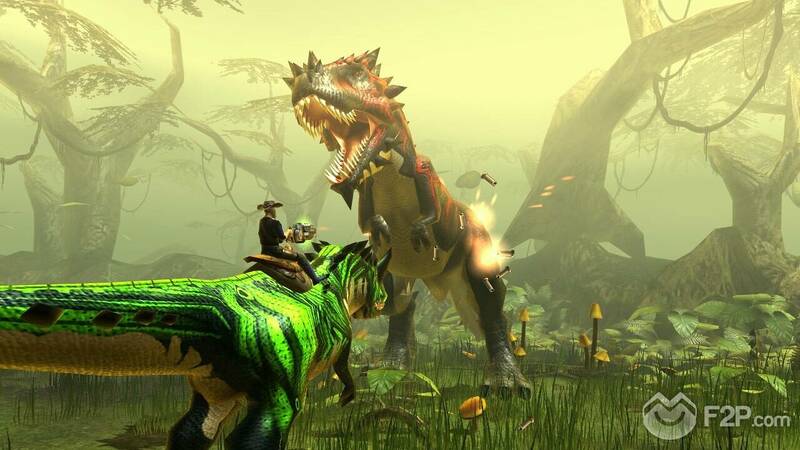 We were not able to try PVP, so we could just kill several kinds of dinosaurs in PVE mode. The game also supports guilds and a capture and hold style gameplay. Hold points of interest and you're rewarded with gold coins or dollars. 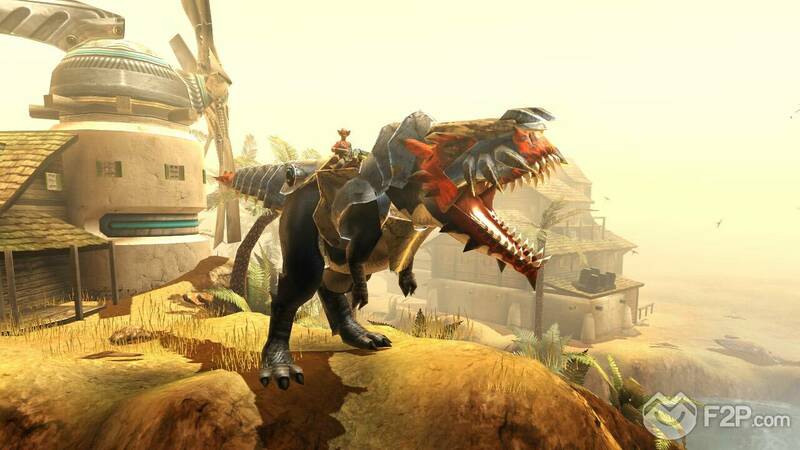 To sum up, Dino Storm have a certain feel of quality, it look nice with quality graphics and is easy to play. The concept of dinosaurs, cowboys and laserguns is funny but the game is not as fun as we expected because of the gameplay mechanics a little slow paced (even collecting the dropped items is slow) and a bit to rigid.